The Return of Nick Diaz - What is the Endgame? The Return of Nick Diaz – What is the Endgame? Unless you’ve been living under a rock (or you have no interest in the sport of MMA, in which case why are you reading this?) you may have heard about the rumoured return of one Nickolas Robert Diaz. If you don’t know who Nick Diaz is, you may at least know of his little brother, Nate Diaz. After a four-year absence for Stockton’s favourite son, what awaits the returning hitter amidst the ever-evolving UFC landscape? Four years is a long time in sports. It may be an even longer time in combat sports. Fighting progresses quickly and new fighters come along every day. Many of those fighters possess qualities seen in older fighters, just tightened up and combined with other attributes. When we look at the roster, the people breaking through back in January of 2015 – when Nick last fought – are now at the top or have been surpassed. Back when Diaz last fought all but two championships were held by the same person as now. Jose Aldo was the featherweight champion, Rafael Dos Anjos was the lightweight champion, Robbie Lawler was the welterweight champion, Chris Weidman was the middleweight champion, Jon Jones was the light heavyweight champion and Cain Velasquez was the heavyweight champion. That is a vastly different landscape. It’s worth asking if Nick Diaz fits in anymore. How does nick fit in? Earlier this year I wrote a piece on a potential Nick Diaz return. In it I posited that perhaps Nick could provide a remedy to a few of the problems MMA has encountered as of late, a bullet of truth piercing through the political membrane. My stance has changed somewhat since then. I still think Nick is a welcome addition to the soap opera, but can he move the needle? And can he move it in the right direction? A revenant from a bygone era, Nick was a travelling brawler winning titles across multiple promotions with a middle finger permanently erected for the benefit of America. A swearing and weed smoking street kid with a black belt and a bad attitude, the welterweight became famous as much for his antics outside the cage as inside it. With a list of quotas longer than Chris Jericho’s submission repertoire, he spoke his mind and heart, utterly refusing to become something that the sport might have needed to become mainstream. Think of GSP, now imagine the perfect villain for the Canadian, that’s Nick Diaz. In this writer’s opinion, Georges St-Pierre vs Nick Diaz is top five rivalry material, despite the fact that they only fought once, and that fight wasn’t very good. The conference call between the two is still one of the most entertaining trash talking sessions in the sport’s history. It was also supremely enlightening. The two men were total opposites. Georges the consummate, tailored suit wearing professional. A reserved competitor with a scientific approach to the fight game. Nick was a hoodie wearing and abrasive no-shower known for his chaotic and relentless style of combat, taking one to give one. It was as Goku and Vegeta as it gets, but unfortunately the fight itself wasn’t competitive, with St-Pierre’s wrestle heavy offense dominating proceedings. Again, enlightening. Georges was a prototype of sorts for the sport, being the first man to really become a true complete mixed martial artist. His strategic approach to training and improving provided a blueprint for future generations. Nick, by comparison, was old school. Determined to have his fight, and if you wrestled your way to a decision victory then you were cheap. After four years away, it’s difficult to imagine the gap between the O.G. Diaz brother and the newer generation has done anything other than widen to chasmic proportions. If Nick Diaz returns then what is the goal? If we assume that this isn’t solely financially motivated (very much within the sphere of strong possibilities) then what does Nick want? The competitive itch just too much, or does he want to bring something different to the sport? Whatever the case, the speculative return fight ticks boxes and then some. Jorge Masvidal is very much cut from the same mould as Nick, from both a stylistic and personal standpoint. Both move in one direction with a boxing heavy offense and have little love for stallers and time wasters. They also have a similar appeal. Old School cowboys with similar backstories, very street and very unpolitical. Both Diaz brothers have issued their respect for “Gamebred” before, and that is not something you can say of many fighters. The fight is great, and if it does indeed come together then we are in for a throwback slugfest. It’s beyond the fight where questions arise. Despite it being a perfect return bout, this isn’t marquee stuff, other than it being Nick Diaz’s comeback. If Nick was to return most presumed it would be big money fights outside this ranking’s ecosystem. If Diaz were to win this fight it puts him right back in the mix at welterweight, but is that where he needs to be? Is that Nick’s role? Can he just become another guy climbing the ladder? His last fight was against Anderson Silva at middleweight, not something that would have moved him along the traditional path of a UFC fighter at that point in time. Also, Nick sorta kinda hates fighting. He’s never been shy about that and now, at 35 years of age, has he found the motivation to once again ascend through the ranks? I don’t buy that narrative. To be honest, I don’t know what narrative I buy. For Nate the ill-fated Poirier fight was clearly a path back to Conor, but I don’t know where Nick has his sights set. That’s one of the appeals of the man, we literally cannot parse his intentions. When it comes to guys like Nick its important to be in the moment. We don’t know where his return is going, or even where it can go. We just need to enjoy the man while he’s around. And this fight… It’s reward enough in itself. 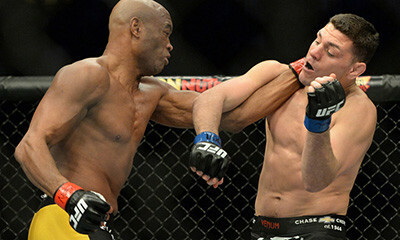 Images courtesy of espn.com and fightland.vice.com.